It’s just human nature to feel a sense of dread and skepticism when a beloved classic is about to be “remade for modern times.” It’s even more blasphemous when Hollywood decides to remake an “untouchable” film such as Casablanca, E.T. The Extra Terrestrial, or Back to the Future. One of those films considered by many to be an “untouchable” is the 1959 classic Ben-Hur, starring Charlton Heston. The film won 11 Academy Awards including Best Picture, Best Actor, Best Supporting Actor, and Best Director. Those are some big sandals to fill but that hasn’t stopped Paramount and MGM from attempting the impossible and adapting Ben-Hur for modern audiences. Is the modern telling of Ben-Hur able to overcome the huge expectations or does it fail due to the constant comparisons to the 1959 film? The 2016 version of Ben-Hur does certain things that are vastly superior than the 1959 film, but the film is missing one really big element: Inspiration. Essentially it’s an uninspired film whose sole purpose was to inspire. 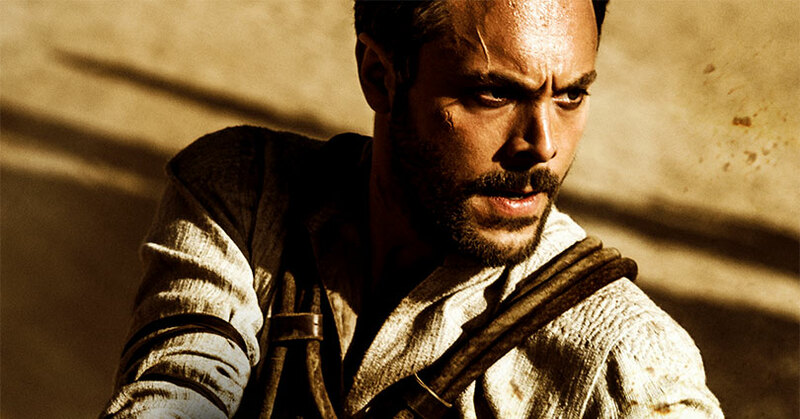 Ben-Hur follows Judah Ben-Hur (Jack Huston), a prince whose family is the most influential in town. When his adoptive brother Messala (Toby Kebbell) accuses Ben-Hur of treason, he is swiftly stripped of his title, separated from his family and the one he loves (Nazanin Boniadi). After years of being at sea as a slave, Ben-Hur returns home and meets Ilderim (Morgan Freeman). Together, Judah seeks revenge on his former brother by competing against him in the dangerous chariot races. Although plenty questioned the remaking of Ben-Hur, that hasn’t stopped John Ridley from trying. This time around the Oscar-winning screenwriter stayed more true to the 1880 novel than the Charlton Heston version. Films back then were made much differently than they are now. Ridley’s script expands and improves on much of original, including expanding upon the pivotal relationship between Judah and Messala. However, the ending rather blatantly tips towards a spiritual uplift which becomes incredibly clichéd. Christian believers will be reaffirmed by the message at the end, but more casual viewers will find themselves eye-rolling at the obviousness of it all. The world that Timur Bekmambetov (Abraham Lincoln: Vampire Hunter) created is a beautiful one. From the costume to set design, everything looks authentic to the time period. And as with any Bekmambetov film, the visuals and action set pieces are incredible. For a Ben-Hur remake to even be considered a success, the iconic chariot race needed to be great and Bekmambetov knocked it out of the park. The chariot race is as thrilling as ever. Although this film improves upon the ’59 classic film, it doesn’t do enough to set itself apart from other Roman period epics. The film felt a bit generic, a bit uninspired, and a bit confused. Despite the film’s tight, nimble pacing, the film jumps around a lot between the various characters because it’s unsure on whether or not it’s a faith film or a Roman epic. However, Ben-Hur’s two leads are what’s truly good about this film. Jack Huston (HBO’s “Boardwalk Empire”) brings a lot to the table in his first big budget lead role. He shows the versatility to roll through the spectrum of emotions during Judah’s various stages. Just as impressive is Toby Kebbell (Fantastic Four) as Messala Severus. Kebbell seems to have a knack for playing the villain role, but Messala is a bit different from Kebbell’s previous villainous roles. Kebbell is able to add the necessary layers, depth, and nuances to make his Messala a more sympathetic character. Sadly, Nazanin Boniadi (Showtime’s “Homeland”) and Morgan Freeman (Wanted) are a bit unimpressive as Esther and Ilderim, respectively. Boniadi lacked chemistry with Huston which, unfortunately, is a big part of the film. She also is unable to portray any sort of emotional depth through her different phases in the film. The prolific Morgan Freeman seems to be going through the motions in the film. The fun he seemed to had working with Timur Bekmambetov the first time, looks to have been lost the second time around. As for the rest of the cast, Jesus Christ’s expanded role is still very limited here. While Jesus was a faceless figure in the Charlton Heston film, Rodrigo Santoro (300) gives Jesus a face this time around. Unfortunately, Jesus has all but 6 or 7 lines in the entire film and Santoro’s talent is highly underused here. Pilou Asbæk (HBO’s “Game of Thrones”) is also highly underused as Pontius Pilate. For such a recognizable role, Asbæk is barely in the film. Overall, Ben-Hur is an admirable attempt at remaking a classic film for modern audiences. The film largely succeeds in achieving its modest goals, delivering an inspirational story in a mostly engaging fashion. With its well-staged action sequences and two solid leads, Ben-Hur may be entertaining enough to grab the attention of those attending Sunday school.